With prices for pure vanilla at astronomical levels, many commercial users are switching to cheaper alternatives. That means vanillin. There’s a lot of confusion about vanillin, because it is often thought of as an artificial ingredient. In fact it’s the most prominent flavor component of vanilla beans. You can buy vanillin in several ways: in blends with pure vanilla to stretch out costly extracts, as a “natural” flavor derived from other sources in nature, or as chemically synthesized imitation. An important new development is vanillins derived from natural non-vanilla sources using natural chemical reactions such as fermentation. Some of these vanillins are organically compliant. Vanillin is produced chemically in three basic ways. We’ll use this term for the vanillin naturally occurring in the vanilla bean pod. The highest quality beans contain about 2 percent vanillin. ferulic acid, rice bran oil or sugar. Created entirely in a lab. Common synthetic vanillin substrates are wood pulp. No matter what material vanillin is derived from, all forms are chemically identical and therefore taste, smell, and behave identically. Pure vanillin is exclusively found in vanilla beans and is never processed out of the bean pods. The value of pure vanilla comes not from the vanillin alone, but from the delicate complexity of over 400 known flavor components coming together in a unique flavor that simply cannot be duplicated. Synthesizing vanillin from vanilla beans would be like isolating a single component of an expensive and complex red wine and throwing the rest down the sink. It is much cheaper to synthesize vanillin chemically, or to derive it from other natural products such as cloves or rice that are far less costly than vanilla beans. Like most flavor components, pure or synthetic, vanillin is a six carbon ring, called benzene, depicted as a hexagon with alternating dashes. The benzene ring is very prominent in nature, and so has many sources besides vanilla. 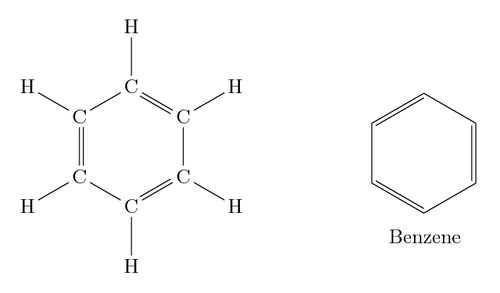 Benzene rings also can be created through chemical reactions from base materials that contain at least six carbons. Vanillin is an aldehyde, which means it has a group of carbons double-bonded to an oxygen atom and single bonded to a hydrogen atom. Shown below is a basic aldehyde structure. 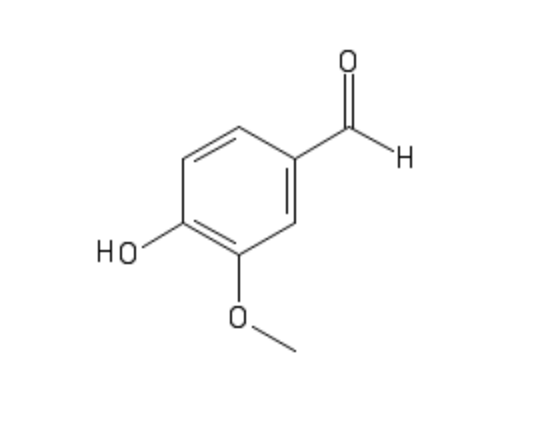 (The R represents any carbon grouping; for vanillin, this would be the benzene ring.) Vanillin also has two more oxygen groups opposite to the aldehyde. Synthetic vanillin is usually derived from the closest and cheapest chemical structure occurring in nature. Historically, lignin, a byproduct of the paper industry, was used as a starting block. As you can see in the structure of lignin below, it shares the benzene group and the two oxygen groups. Only one reaction is needed to add the characteristic aldehyde group. Synthetic vanillin is now also derived from guaiacol. The final product of all these processes is chemically identical to pure vanillin. Humans are unable to taste any difference, and there are no toxins or worrisome chemicals added in the process. In fact, the only way to detect any difference is to run a carbon-14 test, which is able to determine the unique “fingerprint” of the original source of the carbon. A new vanillin is now on the market that is labeled natural vanillin. This vanillin is derived from a biosynthetic reaction involving fermentation of rice derivatives or sugar. It is labeled natural vanillin because it uses a natural chemical reaction — fermentation — to transform the substrate into vanillin. This is a fairly new method used by just a few companies and so is about 10 times more expensive than synthetically derived vanillin. The best, highest quality vanilla is always going to be pure vanilla extracted in water and alcohol from the vanilla bean, with its more than 400 flavor components. It is also very expensive right now. If pure vanilla extract is not an option, vanillin derived from other sources are chemically identical and taste the same. There may be variations in purity, or the percentage of vanillin in the end product, because all chemical reactions have byproducts, completely tasteless and safe, that can never be completely removed. Typical batches are above 95% vanillin. Synthetic vanillin sells for roughly $10/kg. The new natural vanillin on the market sells for hundreds of dollars per kilogram, even though it is of comparable quality to synthetic derivation methods. The only difference is that it is manufactured using a natural chemical reaction. This does not mean that it is chemically superior or in any way closer to the vanillin in vanilla bean pods. The only difference is the process, and the ability to use the “natural” label. These are the products that are being organically qualified. This provides the first real alternative to pure vanilla for organic users and those who must declare only natural ingredients on their label. These “natural” vanillas are making big inroads in the current vanilla market. All vanillin, whether from the vanilla bean, synthetic reactions, or natural reactions is identical in every meaningful way. At Cook Flavoring Company we have more than 200 variations of vanilla extracts at every price point ranging from our highest quality pure extract to natural blends to imitation. With 100 years of experience, we know that the best vanilla extract comes from top quality vanilla beans. No lab can replicate nature’s incomparable creation. No matter how vanillin is derived, it cannot match the hundreds of other flavor structures in those marvelous vanilla pods. But in today’s market, vanillins can help stretch the pure extract or serve as a substitute until bean prices fall. Thank you so much, Hillomaisteri! My hub brought home a small bottle of vanillin powder from the reduced bin at the market. I decided to add it to my oatmeal this morning. It was so bitter I couldn’t eat it n had to toss it. ( I used a couple shakes of the container). I thought I’d b able to use it in baking, but the bitter taste is very unpleasant n am apprehensive to use it. Any tried n true recipes for this? Can this b substituted for vanilla extract? Thank you for your comment. Unfortunately vanillin powder is pure vanillin, a synthetic substitute for pure vanilla, and is extremely strong and has an artificial taste. If you use this product at all, we recommend substituting at 1/10th ratio. If you’re looking for a pure vanilla powder, we sell an excellent one. Hope this helps you out!